A few months ago I started hearing rumblings about a young lady who had written her first book about the gospel and the teen years. A little while later, Jaquelle Crowe and her dad showed up one Sunday and joined us for worship. 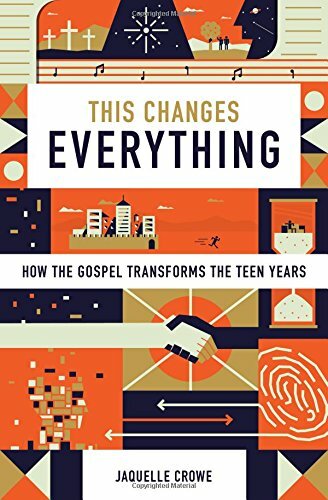 After reading her book, This Changes Everything: How the Gospel Transforms the Teen Years, which my kids will be reading this summer, I wanted to get this much needed book in the hands of the three groups of people who need it most: teens, their parents, and the church leaders that lead them. We have two copies to give away (more on how to enter later), but first I want to introduce to the author. Pat: Tell me a little about yourself. Jaquelle: I’m nineteen, and I live in Halifax, Nova Scotia. I graduated from university at the end of 2015 after studying communications and English and am a full-time writer now. I also run an online membership community for young writers called the Young Writers Workshop and host a podcast for youth with my dad called Age of Minority. And for fun, I love to read, cook, eat, explore, hang out with cool people, and write (obviously). Pat: What prompted you to write your book? Jaquelle: There were two primary reasons. First, because it was the book I wanted to read as a young teen – something that was gospel-centered and practical and written for the unique, specific stage of life I was in. I ended up reading a lot of fantastic books on Christian living, but they were all written for adults. Which leads to the second reason I wrote this book – because I saw a need. I began interacting with more and more young Christians like myself, and we were all looking for this kind of book. The Lord graciously began opening doors, and here we are! Pat: Why do you think the teen years are so critical for faith development? aquelle: J.C. Ryle referred to youth as “the seed time of full age … the moulding season in the little space of human life,” and I think that perfectly captures why the teen years are so critical for faith development. The teen years are preparing us for life. They’re cultivating the habits, virtues, vices, loves, and fears that will remain with us as adults. They’re when we learn the most, when we’re most shaped by what we hear and believe. This is why teens desperately need the life-giving truth of the gospel. Pat: What was the process of writing like? aquelle: The bulk of the book was written over a span of four months in 2016. I’m a planner, so I drew up outlines for each chapter, and then tackled each one individually. Most chapters went through 2-3 drafts. I’ve heard it said that writing is rewriting, and that was certainly true for me. I also got a lot of feedback. My parents read almost every draft of every chapter. I had a team member at Crossway read each chapter and offer feedback. Before the book’s final edit, I had a group of teens and twentysomethings read the book and give their thoughts as well. So the process was a cycle of planning, concentrated writing, editing/rewriting, and receiving and implementing feedback. Pat: What do you hope your book does for those that read it? aquelle: I hope it upsets the apathetic, that it communicates the hard truth that Jesus demands absolutely everything. But I hope it encourages the faithful, that it fills them with supreme joy and inspires them to know that they’re not alone. I hope teenagers love Jesus more. I also hope this is a helpful tool for parent-teen discipleship, that it gives parents more insight into their teens’ spiritual lives and that it sparks rich and honest conversations about faith and sanctification. Pat: What’s next for you? aquelle: Wherever the Lord leads! I’m focusing on the current things on my plate right now – traveling, speaking, leading the Young Writers Workshop, and writing. I’d love to go to seminary in the next few years, and I’d also love to write another book. But we’ll see what happens. Here's how to enter the giveaway: Write something creative and post to Facebook and/or Twitter using the hashtag #GCFgiveaway2017. There will be one randomly selected winner from each social media platform who will each receive one copy of the book. Enter as many times as you'd like. The drawing will be held on Friday, June 30th, 2017. Tim Challies put together a post of books teens should read. He says, "... each of them is suited to twenty-first century teenaged readers and together they will provide a foundation for the Christian life that will prove both deep and wide." Parents lead the way in giving your teens great resources. Use them as conversation starters or even for family devotions. You will learn right alongside them. The Desiring God site had a post by Kristin Tabb on kids in worship. She describes it this way, "What you want is refreshment and inspiration; what you get is low-level tension, discomfort, and distraction as you brace yourself for what might happen next." She goes on to explain both the weariness and the wonder of it all. Parent's of little one, read this and be encouraged. Our friend, Timothy Paul Jones, wrote a post entitled, "Advent: The Difficult Discipline of Celebrating the Waiting". In it he writes, "... Advent reminds me that time is far too precious to be killed, even when that time is spent looking ahead. Advent is a proclamation of the sufficiency of Christ through the discipline of waiting." He goes on to explain the meaning of waiting and its importance. What have you been reading or writing online lately? Leave us a link in the comment section and we will check it out.